The highest level of unbiased trade expertise in the region. Whether you’re an international company expanding to Colorado, or a local business breaking into new markets globally, we’re here to help. Our sole purpose is to help local companies succeed internationally. Global commerce isn’t just one of the things we do, it’s the only thing we do. Participate in peer-to-peer training, consult with trade experts and make international business connections both locally and around the world. No matter your industry or size, whether entrepreneur or global enterprise. Through our services, we strive to improve understanding, increase revenues and inspire confidence in global trade. We provide tools, resources and customized advisory solutions to help you choose markets strategically, mitigate risks and increase revenues and operational efficiencies as you expand. No other organization can come close to the breadth and depth of unbiased international business expertise you have right here. You don’t have to go global alone. Interested? Talk to an expert today. Download our Services Brochure for more information. No matter your size or experience we have services that meet your needs. Click on our interactive diagram to learn more. Get quick access to the answers you need through the Help Desk for first-line assistance and an extensive online global resource library. From launch to growth and optimization services, our expert advisors will guide you through the complexities of trade regulations, help you streamline global business strategies and optimize your international operations or supply chain. We can also save you time and trouble by authenticating or “chamberizing” export documents such as commercial invoices, Certificates of Free Sale, Certificates of Origin and Export Registry Forms. Choose from a large catalog of international business courses or train your whole team with customized on-site or virtual training sessions. Whether you need domestic introductions or international connections, our referral network gives you access to over one million affiliated companies in 100 countries. 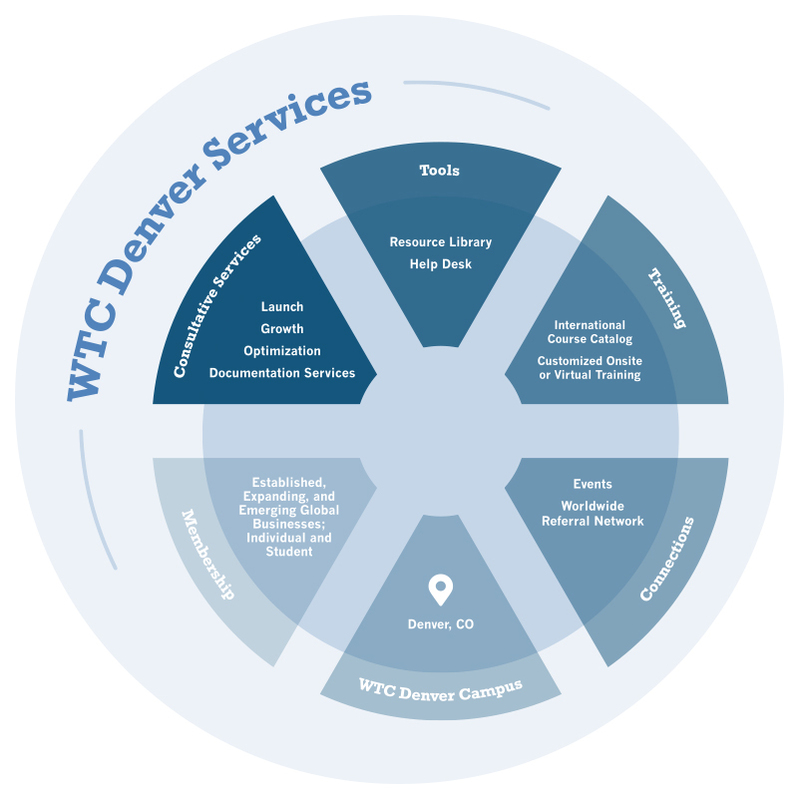 Located in Denver’s RiNo Art District, the new WTC Denver campus - coming in 2020 - will be the epicenter of global commerce in Colorado. Click here to learn how you can be involved in our new campus. Whether you import, export, have global operations or support companies who do, there’s a place for you here. Click here to join our network.